From London - Travel time is approximately 3 hours via the M4 Westbound. From Birmingham -Travel time is approximately 2.5 hours via M5 Southbound and then the M4 Westbound. From the East - Exit the M4 at Junction 29 and follow the A48M towards Llandaff. Join Cardiff Road. 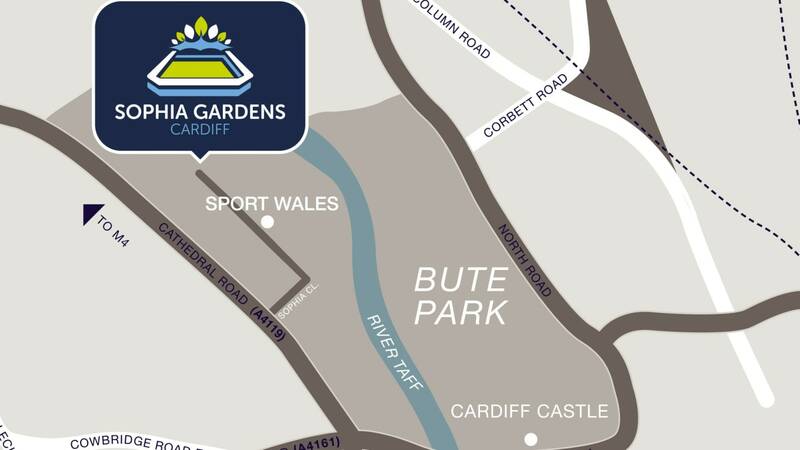 Sophia Gardens is situated off Sophia Close which is on Cathedral Road. From the West - Exit the M4 at Juntion 33. Follow the A4232 for 6.2 miles and exit on the slip road onto Leckwith Road. Follow the A4161 and then turn left onto Cathedral Road (A4119). Turn right onto Sophia Close where Sophia Gardens is situated. Parking at the Stadium is limited, so event organisers are requested to liaise when booking their event with the venue.